The mission statement of the Washington & Jefferson Hockey Team is the pursuit of personal development, teamwork and love of the game while excelling as a student. We compete to win, not only as a team, but as individuals in our sport of hockey and in life in general as we prepare for our careers after college. Our creed is to develop the acceptance of victory as well as defeat with dignity…while building the values of integrity, fair play and good sportsmanship. 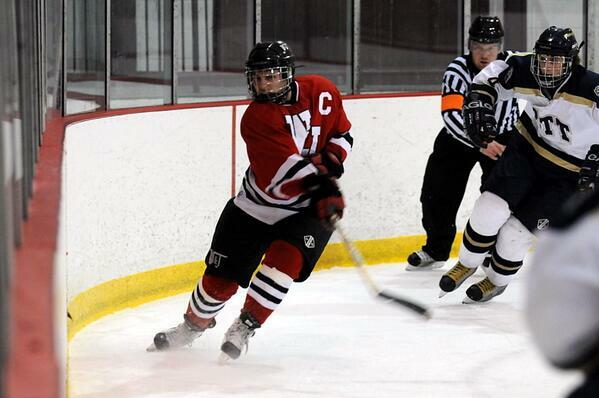 Washington & Jefferson (W&J) hockey began in 1998 when a group of W&J students led by Tom Carnaggio, James Bissell and Joe Morascyzk got together and asked the school’s administrators if they could form an ice hockey club. With the help of Dean Jeffrey Docking (now President of Adrian College in Michigan), they organized a team and joined the Western Pennsylvania Collegiate Hockey Association (WPCHA, now College Hockey East/CHE), which competed in the American Collegiate Hockey Association (ACHA) Division 3. In 2001, after winning the 2000-2001 WPCHA title with an undefeated league record, the W&J Presidents joined the Eastern Collegiate Hockey League (ECHL) as they jumped up to the ACHA Division 1 level. In 2003, the Presidents left the ECHL to compete as an ACHA Division 1 independent, and eventually joined the newly formed Collegiate Hockey Mid-America (CHMA) conference in the ACHA Division 1. The Presidents won the CHMA Regular Season Championship in 2006-2007 and CHMA Tournament Championship in 2007-2008. The Presidents have had many great players and coaches throughout the years, for more information please click on the “history” link. In 2014 the Presidents returned to College Hockey East and play primarily against western Pennsylvania area colleges with rich hockey traditions that include West Virginia University, California University of Pennsylvania, Carnegie Mellon University and Gannon University. All of W&J hockey’s home games and practices are held at the Iceoplex at Southpointe which is the former training center of the Pittsburgh Penguins. The Iceoplex is located approximately 15 minutes away from the Washington & Jefferson campus. The Presidents have their own dedicated locker room in the arena where all of the players can store their equipment in their own individual lockers. Washington & Jefferson Hockey Team is always looking for outstanding student athletes. If you are interested in playing competitive collegiate hockey while attending an exceptional college, then W&J’s fast growing hockey program is perfect for you. The best way to get started is to contact Coach Trevor Kuhlman at 724-316-2115 or email tdk91785@hotmail.com or contact Matt Wieszczyk at 814-648-1705 or email matt@mpfmgmt.com or go to our recruiting page https://wjhockey.com/recruiting .